The new big screens, they’re massive and the pre-match montage looked superb on them. That was the highlight of my day really. 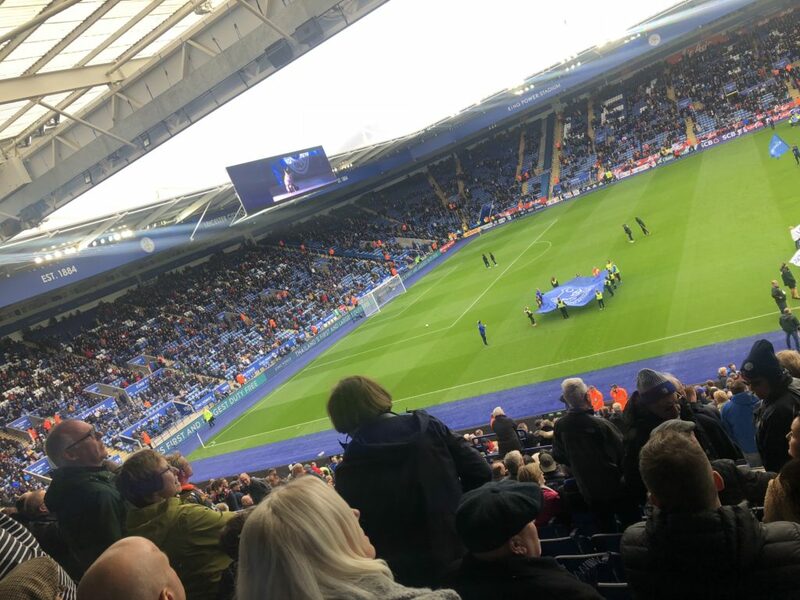 Leicester went behind with some more poor defending, Bernard pushed through Ricardo and Amartey to cross to the backpost, Chilwell had left Richarlison who volleyed unmarked home from 6 yards or so to silence the home crowd. Now, Jamie Vardy had more than his usual amount of chances in this one, a glancing header in the 15th minute went wide and then 10 minutes before the break he was one on one when you’re usually putting all your chocolate buttons on him scoring but yet again his effort went wide. Ricardo scored a ripper in this game, picking it up in his own half and playing a one two with Iheanacho, bursting down the left wing, cutting inside before riffling his shot into the bottom corner, I screamed it home, it was a cracking team goal, exactly what Claude Puel is after. This game turned on a red card for Wes Morgan, his second of the campaign and frankly he could have seen his second yellow before the 63rd minute; he went straight through Richarlison and sent him into the advertising hoardings and got away with it, not his foul from behind just after the hour though, referee Mariner quite rightly sent him off. Everton took control from there on in and scored what turned out to be the winner in the 77th minute, Sigurdsson with a Cryuff turn 25 yards out, his shot though was unreal, it was struck with the real ‘foot through it’ power but got dip on it too, it’ll contest goal of the month I’m sure. Daniel Amartey had a chance to level it up in injury time though with a free header from a corner in the 6 yard box which went agonisingly wide. It was yet another frustrating display which showed promise but there’s something missing, not clicking, Vardy doesn’t seem himself. Maybe it’ll come but it feels like everybody is stood outside the shop waiting for it to open.